1. Date of provisional admission for counseling of the B.P.Ed. Students 10.07.2017 .The entire counseling list is provisional, mere name in the list does not give any guarantee for admission. 2. The students will report at 10.30 am positively before the room of the Principal, U.C.T.C for counseling. 3. The Hostel rooms are limited and will be provided as per merit. 4. After counseling,the student will collect the Bank Challan from the office and deposit the money as denominated in the challan to the Bank of Baroda,BERHAMPORE ,BRANCH and must have submitted the same to the College for final confirmation of the admission. 7. Discrepancy if any, found in the merit list should come to the notice of the Principal with all relevant documents within 7 days from the publication of merit list AND THE LIST BE RECTIFIED IF ERROR ARE THERE, But after admission there is no chance of rectification..
*This may be varied on special circumstances. The entire list is provisional list of counseling. The candidate should bring all original documents on 11.4.2016 at 10.30 am for counseling. After counseling, the candidate will receive a Challan to be handed over to him/her. 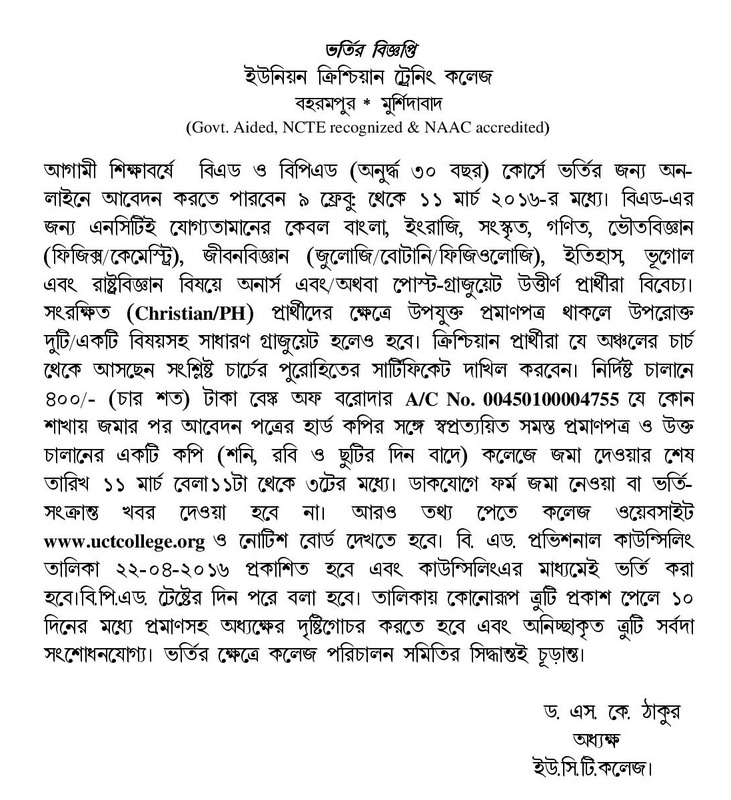 The filled in challan for deposition of admission fee (2016-18) be deposited to the Bank of Baroda Berhampore Branch near Sreeleathers, on the same day. After deposition two copies should have to be brought to the college for confirmation of his/her admission. All students will take their seat at room no -3 at 10.30am neither, his /her counseling will be liable to be rejected. 2016-03-29 : Notification for Deputed Applicants Which Should be Prepared and to be Submitted on the Day of Submission of Application. Rs.18,000/- extra for a students who will take admission in hostel. There is no seats for B.ED boys hostel. Seats are limited and be provided as per merit on desire. B.P.ED. Counseling date is 11.04.2016 at 11-00 A.M. and after counseling, admission will be on the same day on 11-04-2016. 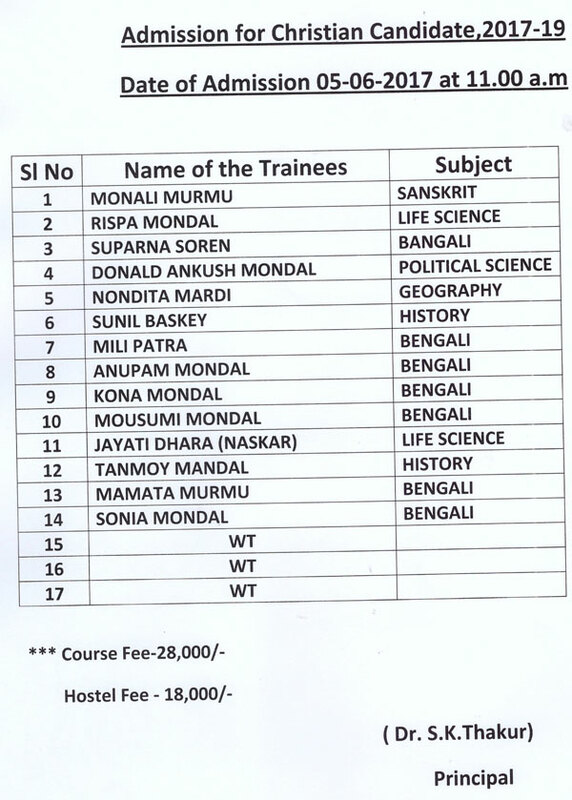 List for B.P.ED. counseling will be published on 6-04-2016 .fee will be submitted on the day of counseling. After rradication of problem, online B.Ed. Admission forms for fresher's & deputed (teaching ix-xii) are available from 21.03.2016 to 20.04.2016.all deputed teachers must enclosed the ix-xii teaching certificate from H.M. and duly countersigned from D.I. of schools. ***Those who have applied earlier as per our notification need not to apply again, but deputed teachers must submit a certificate noting "The teachers who is applying for the B.ed. course for the session 2016-18 is a teacher for class ix onward"
2016-03-10 : Admission Notification for B.Ed Session 2016-18 will be Reopening Shorty. Please keep visiting website for the latest notification. 2016-01-21 : Admission Notification for Session 2016-18 will be published shortly. Admission Notification for Session 2016-18 will be published shortly.